The church of St.Nicolas The Wonder-worker in Rantue is situated on the high cape on the western shore of Riekkalansaari Island, about two kilometers from the center of Sortavala town. 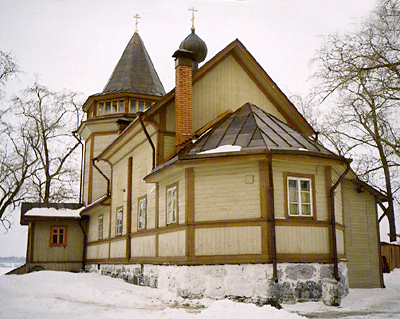 It is a successor of one of the oldest orthodox churches in Ladoga region – main church of old Karelian St.Nicolas – Serdobol circuit. The exact date of establishing the church with graveyard on the shore of Läppäjärvi lake is not known, but in the 1499-1500 census book of Vot pyatina (region) of the Novgorod The Great there is a mention of "a graveyard and the church of St.Nicolas the Great". Till 1636 there was an orthodox monastery on the Riekkalansaari Island (the first part of island name itself – Riekkalan – is a Finnish derivative from Karelian word "kreikalan" – Greek). "... There is no Russian church in the town, it stays some 10 furlongs from the town on the left side of the bay and one hath to ride there from the town. Only a priest and a reader are living there and though it is rather a big parish (660 men and 580 women), the church is very ramshackle. Parishioners are mostly Karelian and do not understand Russian so the priest hath to interpret the service to their language, which doth not have any books written on it." In Viborg clerical 1831-1841 archives there is a note about the church that "... nobody know who and when built it. The building is wooden, with also wooden belltower, very ramshackle". By the end of XIX century the church was in use only in summer in some holidays and days of pray for the dead. The belltower was so inclined that was almost falling. The parish started to gather money for reconstruction and by 1890, with the help of missis Elisabeth Hallonblad the needed resources were accumulated. In clerical 1894 archives it is said: "Very ramshackle church of ... St.Nicolas on the island ... was reconstructed in 1891 using the funds given by private persons and the parish and consecrated by His Right Revend Antony Bishop of Viborg on July 2nd 1892. The service in the church occurs on December 6th, May 9th and other day, if parish wish so". During the reconstruction the church was taken apiece and brought back again in almost the same exterior. New foundations were built for the church and belltower. There were no big changes in the exterior – the church walls were planked, one storey of the belltower was glassed and placement and dimensions of some windows were changed. The church remains without heating. As old paintings became unusable, the restored icons from old town's Peter and Paul church were used. The main icon "Let your children come to me" was painted by famous Russian artist Vasily Petrovich Vereschagin. During evacuation in March 1940 all the interior of the church was left in place. In the end of summer 1941 it was found destroyed, all six bells were lost. The icons were found in the attic of one of nearby houses. During the second evacuation in September 1944 there was no possibility to evacuate them and the fate of the icons is unknown. In Soviet times the cupola and crosses on the building were destroyed and the building was used a peoples house and a library. The building was equipped with the stoves and there was build an additional entrance. The church was surrounded by the ancient graveyard, the remnants of which can still be seen.